Who Else Wants the Best Ab Workout for a Ripped Midsection? Have you been searching for the best ab workout to get a set of ripped abs? Most people refer to their abs as if they were one set of muscles. However, the your abs are really a set of four muscle groups. Each needs to be worked for you to really have a set of eye popping, ripped, six pack abs. But before we get to the workout, it is important to remember that no matter how many times you perform the best ab workout below, you will never see your six-pack abs unless you burn the layer of fat that covers them. Fun Fact: It can take more than 200,000 crunches to burn one pound of fat. Click here for tips and tricks to get 6 pack abs. What Muscles are Worked in the Best Ab Workout? Obliques (Internal and External). Your obliques are located on the side and front of your midsection, right around your waist. The internal obliques are located just below your external obliques. 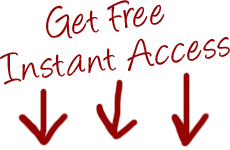 As you can see in the picture, the internal obliques cross the external obliques diagonally. The obliques are responsible for twisting movements and bending at the side. Rectus Abdominis. For most people, this muscle is the one that they are thinking of when they say they want six pack abs. This pair of muscles runs along the front of the abdomen and is separated vertically by the linea alba. It is crossed by 3 or 4 fibrous bands called the tendinous inscriptions. These bands are what produces the six pack when the abdominal region is well defined. 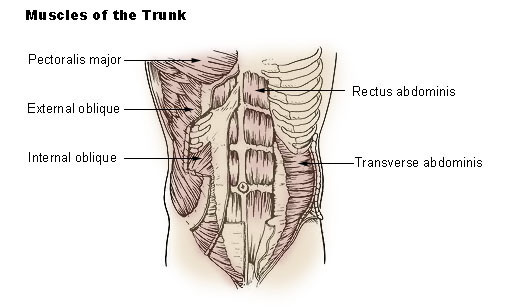 Transverse Abdominis. The Transverse abdominis is the depest muscle in the abdominal region and is located just under the internal oblique muscle. Though you cannot seen the tranverse abdominis, it acts as a "corset" to help hold your stomach flat and aid with pelvic stability. Not only will this muscle help with definition for your six pack abs, but it will also help you to use more weight in all of your lifts, due to its "weight belt" effect. These three groups of muscles make up your six pack abs. However, there is one other group of muscles that should not be ignored to round out your core muscles. Erector Spinae. The Erector Spinae is a collection of three muscles running from your neck to your lower back. The are called the splenius, logissimus, and the Iliocostalis. These muscles act to extend your back and are important for overall posture. Working these muscles balances the work you are doing with your abdominal muscles and should be worked when performing this ab workout. You will notice that I prefer to use the the exercise ball for many of the exercises in the best ab workout. The exercise ball (sometimes call a Swiss ball) allows for a greater range of motion. If you were to simply lie on the bench or floor for crunches, you are not working the abdominal muscles through their full range of motion. However, if you do not have an exercise ball, you should not hesitate to perform these exercise without it; you will still get an outstanding workout. What is the Best Ab Workout? Of all the ab workouts listed on Middle Management, this workout is my favorite. Performed correctly, it will stimulate all of the areas of the abdominals. This workout is an advanced workout. It consists of 12 sets to target all four of the major muscle groups above. As mentioned, an exercise ball, called a "stability ball" is used extensively. However, not having a stability ball should not preclude your from attempting this workout. Simply lie on the floor or exercise bench. *Note: Hold the vacuum for a 10 count on each repetition. Remember: You will never have a ripped midsection if your abdominals are covered with fat. Therefore, remember to supplement this workout program with proper nutrition, weight training, and cardio work to burn fat to obtain six pack abs.